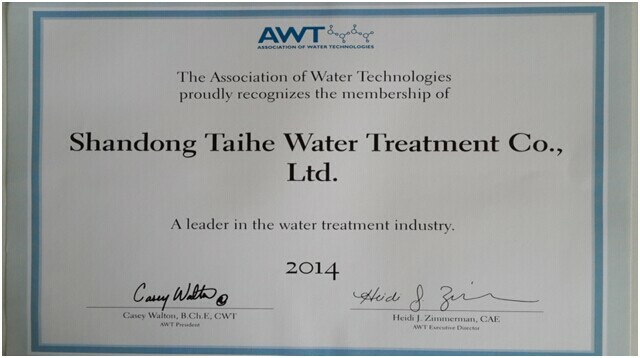 Shandong Taihe joined the member of AWT - Shandong Taihe Water Treatment Technologies Co., Ltd.
Shandong Taihe Water Treatment Technologies Co., Ltd., as the member of The Association of Water Technologies (AWT) for several years, is entitled A LEADER IN THE WATER TREATMENT INDUSTRY 2014. AWT is a nonprofit organization governed by the Board of Directors, which is supported by its committees and staff. It will be the voice of the global water treatment industry. AWT Annual Convention and Exposition is the place to get the tools, skills and connections that will have an immediate effect on the future direction of your business – and impact your bottom line.